The day started off at the Hilton Suites hotel where the bride got her hair and makeup done to look her best on this fruitful day, while the groom was getting suited up with his slick black suit and matching shoes. The bride and groom both celebrated early in the day with some snacks and champagne with their own entourage groups. After the morning festivities, both groups headed off to the Egyptian wedding ceremony which took place at St. Mark’s Coptic Cathedral church, which had more than ample room to house the large number of guests attending the wedding. The church had a modern look combined with a rustic feel that was more than adequate to accommodate this Egyptian wedding. Sandrine was led down the aisle by her father while holding a beautiful boutique of white and purple roses where Ashraf was awaiting the love of his life. Friends and loved ones were teary eyed as the couple was announced husband and wife. As the newlywed couple made their grand exit out of the church, they were greeted and saluted by the ceremonial unit Toronto police force with their flags raised up high in the air as the couple shared a passionate kiss. It was a breathtaking experience for our Toronto videographer and cinematographer who managed to capture it all on film. Next up after the Egyptian wedding ceremony, the couple headed to Edwards Gardens to capture some unforgettable photos of this beautiful botanical garden where Sandrine’s love for photos really came out. After this incredible photoshoot at the gardens, it was now time for the wedding reception. The Paradise banquet hall chosen by the couple for their wedding reception sported beautiful crystal clear chandeliers with a huge centre stage, highlighted by visually stunning purple lighting. It was a spectacular sight to say the least. During the couple’s first dance together, we were greeted with an astonishing foray of cool mist that engulfed the couple, which gave our videographer and cinematographer plenty of opportunities to capture this perfect moment. It was a sure fire way to wow the guests at the reception and make this an unforgettable wedding for all that attended. The couple held no strings back, as we were later greeted with a beautiful white cake that stood high and mighty. It was all laughs and giggles, as the couple played around, feeding each other the cake of their dreams. To show his wife how devoted he was to her, Ashraf surprised her with a birthday cake at the reception as well. 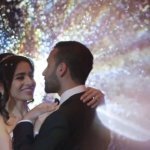 Our amazing videographer and cinematographer were able to produce this heartwarming same day edit video that showcased Sandrine reading Ashraf’s wedding letter and becoming very emotional and filled with elation and joy at her hotel along with the important details from their Egyptian wedding ceremony. In the wedding reception, Ashraf showed off his humorous side when he gave his speech to the audience which was met with laughs and chuckles. To finish the night off, the guests modelling after the energy levels of the newlywed’s took to the dance floor to partake in some fun themselves. It truly was a rare scene and our Toronto videographer and cinematographer felt truly blessed to have had the opportunity to be a part of this impeccable wedding. We here at SDE weddings, Toronto’s Premier wedding videography, cinematography, and photobooth company wish Sandrine and Ashraf a wonderful life together full of joy and happiness.